Last fall, The Blackbird made the move from a small planned community near Black Mountain to land in downtown Asheville, and already the eatery is making an impression within the elbow-to-elbow restaurant scene. The Blackbird’s new nest shows a casually chic face to busy Biltmore Avenue. Glass walls, which fold open to welcome breezes in warmer months, frame a cozy haven in winter. On this cold, wet evening, one wishes to be enveloped by the asparagus-hued walls and warm glow emanating from hand-blown glass lanterns by local artist Hayden Wilson. My first stop is the handsome Crowbar, where you can admire striking avian wall sculptures by metal artist Shawn Oldham, or rest a highball glass on the zinc-topped bar he also created. The cocktail menu showcases innovative elixirs that call out the bird theme. The Four and Twenty blends Jim Beam Rye, sweet vermouth, and orange bitters, while the Hot and Dirty Birdie is a mix of pepper vodka, tangy olive brine, dry vermouth, and Sriracha. I cast my order for the soul-warming Murder of Crows (aka a Dark and Stormy): black rum with spicy ginger beer, a lime wedge, and candied ginger cube. A well-chosen wine list features bottles from almost every continent along with North Carolina’s own and a selection of ports and dessert wines. Since relocating, Blackbird dropped its former American Tavern tagline, but not its brews on tap. Owners Roz Taubman and longtime business partner Chef Bobby Buggia are relishing the advantages of the new digs, especially the jump from 130-square-feet in the kitchen to a roomy 900, where they create what Taubman calls “all modern Southern” cuisine. 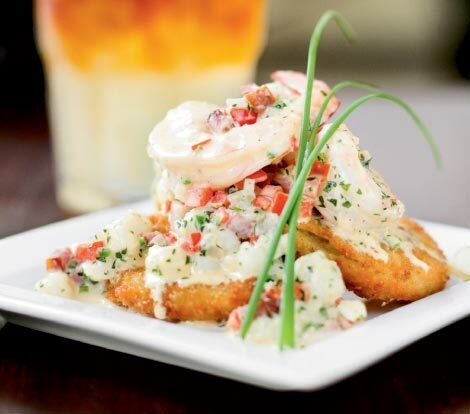 And indeed, two such mainstays join forces in the petit shrimp and fried green tomato appetizer, a delicate but flavorful dish textured with hominy and tasso cream sauce. From the blackboard of specials, we order a beef skewer on a bed of tender kale and quinoa, abetted by a tangy, Asian-influenced, stone fruit gastrique. The sweet-sour combination carries over with Blackbird’s famous sorghum-glazed Ashley Farms Poulet Rouge chicken. This French breed of fowl raised in the Piedmont bears a richness that is countered by the acidity in the glaze. The accompanying green beans and heavenly buttermilk rough-mashed potatoes keep the sophisticated entrée rooted to tradition. After I nab a forkful of perfect North Carolina sea bass with crisp skin on a bed of aromatic lemon risotto, I begin to understand the breadth of versatility Buggia picked up at previous engagements in Charleston, South Carolina, and Sonoma and Napa valleys. Given Taubman’s finesse as a pastry chef—studying the art of patisserie in France—our party can’t depart without dessert. The organic ice creams are blended in house daily, and the dense, much-recommended coconut custard cake with cream cheese frosting calls out to the sweet-toothed among us. Likewise, the three-layer triple mocha torte with a walnut crust offers a dolce finish to an expertly prepared meal. Asheville’s dining scene may be getting crowded with newcomers, but there will always be room for the high-calibre likes of The Blackbird.